When my daughter was three and out for a walk on an autumn day, she pointed at a spider’s web and explained what it was. “Daddy, it’s a website,” she said. It was a visual way to describe a word she had heard but didn’t yet understand. And information graphics and visualisations give us a method to do the reverse: use images to describe a story in a way that we can understand. If children want to comprehend the world around them, infographics can do that. There is a data revolution taking place across the globe right now. From journalism to government, the world’s stories are being told through numbers and facts. But while we treat this as something that only applies to adults, it belongs to everyone. And the younger it starts, the better. This week sees the publication of a book that I have worked on with the father of infographic design Peter Grundy — Infographics: Human body. And in April Animal Kingdom, produced with graphic designer Nicholas Blechman comes out. 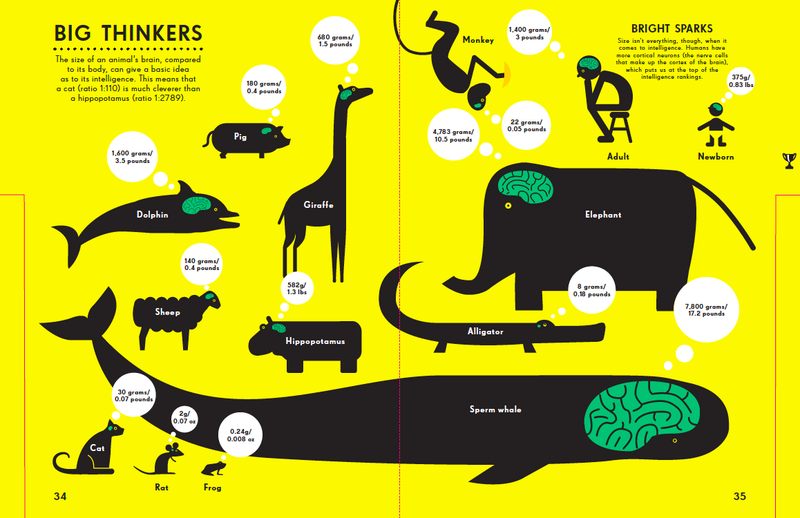 So, why produce a book of infographics for children? Data is a way of tackling vagueness, something children dislike intensely. Facts are black and white, right and wrong to the average six year old. They want certainty. Psychologists have known for a while that showing rather than just telling a child works. This study compared children who had been told something verbally to others who had only been shown an image. The children shown the pictures were more likely to retain that information and recall it later. “Without image, thinking is impossible,” said Aristotle. Pictures work. Alberto Cairo writes about data visualization and teaches Information Graphics and Visualization at the School of Communication at the University of Miami. He points out that understanding infographics is not innate in us – it needs to be learnt. Animal Kingdom designer Nicholas Blechman says the reality of data is enticing and in contrast to the diet of fantasy that children face in their entertainment every day. “So many children’s books fictionalize the world through wildly creative and inventive story telling. There is something refreshing about a book that deals with hard facts,” he says. It’s not about dumbing down or aiming charts just at children. Designer Nigel Holmes is author of the Lonely Planet book of Everything, a visual guide to traveling the world. He says that a major factor is perhaps the most-retro aspect of a book: the paper it’s printed on.